As an exclusive dealer & distributor of Aquatherm/Solar Industries solar pool collectors and solar products, you can rest assured you will be getting the very best of its kind in solar product engineering and manufacturing. Click here for our solar technology information. The solar system is designed to efficiently take full advantage of the sun's radiant energy to heat your swimming pool. The system is comprised of solar collectors and an automatic control unit that work together to create a reliable and carefree heating system. Operating the system is simple! A.) Select and set the amount of heating desired. B.) (Optional) The automatic control unit senses the changes in both sunlight and water temperatures and diverts water to the collectors when solar energy is available and desired to maintain pool temperature. The system functions without the use of any additional electrical energy. C.) Your existing pool pump now circulates water through the solar collectors. D.) The solar collectors, heated by the sun, immediately warm the flowing water which is then returned to your pool. 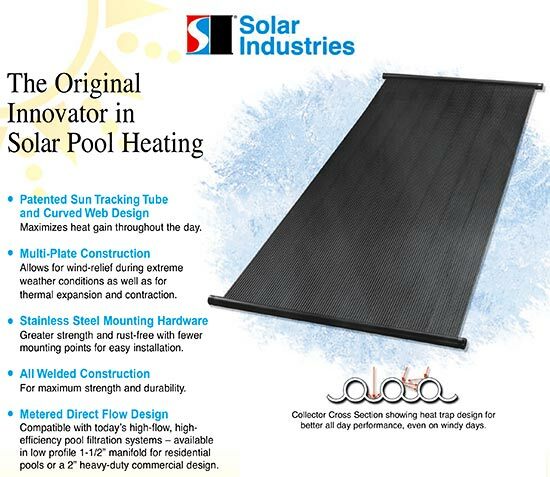 The Original Innovator in Solar Pool Heating Since 1976! 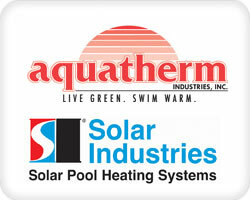 Click here for Aquatherm/Solar Industries features and learn more about the technology.